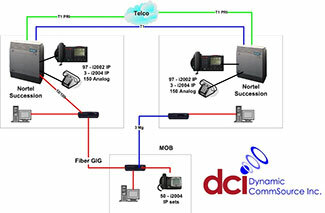 Dynamic CommSource Inc. can help you design and engineer your telephone system or telephone network. We have many years of design and implementation experience and are familiar with all the latest VoIP (voice over IP) and SIP (Session Initiated Protocol) technology to tackle your telecom and datacom needs. We provide this as a free service to customers who allow us to quote them a telephone system or network, or associated equipment. We can also show you how to consolidate and reduce your monthly telecom expenses. Let us show you how to take advantage of technology to reduce expensive monthly Telco services and high speed internet billing. 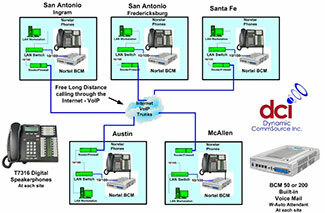 Look below to see some examples of telecom engineering and design services we have provided for our customers. Just send us an email to info@dynamiccommsource.com or call 1-888-234-4975 today for a free quote, or just ask some questions with one of our qualified representatives about our engineering service and we'll get started saving you CASH today. Copyright © 2019 Dynamic CommSource, Inc. All Rights Reserved.